Henry John Temple, 3rd Viscount Palmerston (1784-1865), Prime Minister. Sitter in 144 portraits. Elizabeth Wellesley (née Hay), Duchess of Wellington (1820-1904), Mistress of the Robes to Queen Victoria; wife of 2nd Duke of Wellington; daughter of 8th Marquess of Tweeddale. Sitter in 4 portraits. This is a historic work of art which reflects the attitudes and viewpoints of the time in which it was made. Whilst these may differ from today's attitudes, this image is an important historical document. This image is currently being researched, further information about this image will be updated below. This is an imagined scene, with real historical figures. 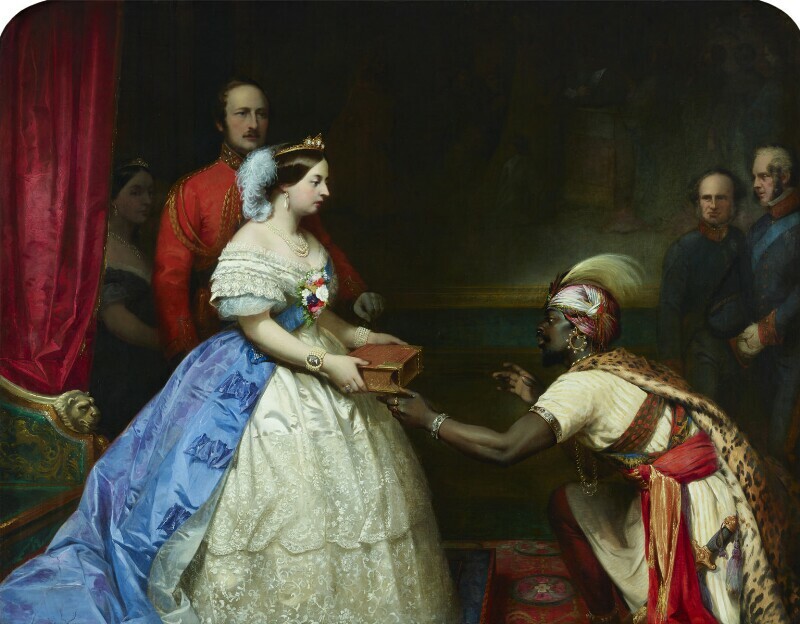 Queen Victoria is shown at Windsor Castle receiving an ambassador from East Africa, to whom she is presenting a fine Bible. An open Bible, with a painted quotation, is carved onto the frame. The scene depicted is based on a popular but unfounded anecdote current in the 1850s. This stated that, when asked by a diplomatic delegation how Britain had become powerful in the world, 'our beloved Queen sent him, not the number of her fleet, not the number of her armies, not the account of her boundless merchandise, not the details of her inexhaustible wealth … but handing him a beautifully bound copy of the Bible, she said 'Tell the Prince that this is the Secret of England's Greatness'. In his desire to blend patriotism and piety, the artist drew on various historical events. The African envoy is probably based on Ali bin Nasr, governor of Mombasa, who attended Victoria's coronation in 1838 and returned again in 1842, together with his young interpreter Mohammed bin Khamis. Although not a portrait, his costume is that of the Omani rulers of east Africa. Both the British government and the Queen frequently invoked Christian faith in respect of foreign affairs. 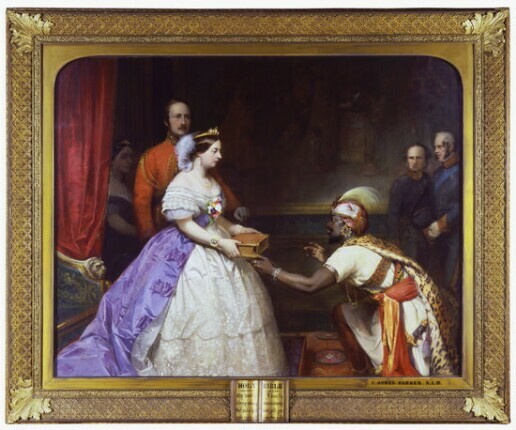 To the ruler of Abeokuta - the Yoruba region of Nigeria - in 1849, Victoria sent copies of the Bible in English and Arabic 'to show how much she values God's word'. To add a contemporary aspect, the artist set his scene in 1861, as the Queen's spreading crinoline shows. She is attended by Prince Albert and two politicians - Lord John Russell and Lord Palmerston, respectively Foreign Secretary and Prime Minister. Probably intended for exhibition in 1862, the painting could not be shown then owing to Prince Albert's untimely death in December 1861. It was first exhibited in 1863 before embarking on a national tour designed to sell the mezzotint reproduction, entitled simply 'The Bible'. The popular anecdote was also illustrated by an as-yet unidentified artist in a coloured print that shows the African ambassador meeting Victoria amid a group of courtiers and ladies-in-waiting. Prince Albert is not present and the envoy stands to receive his diplomatic gift. Prof Prem raj Pushpakaran writes -- 2019 marks the 200th birth year of Victoria!! !